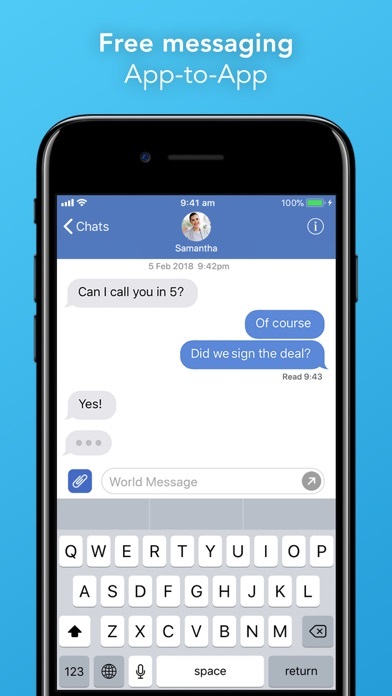 World Message brings together your SMS and Instant Messages in one place. 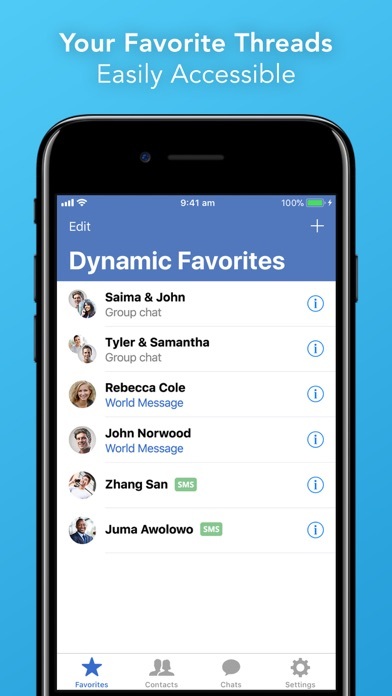 Create groups to chat with multiple people, send rich media messages, lease international phone numbers to SMS from, and much more! 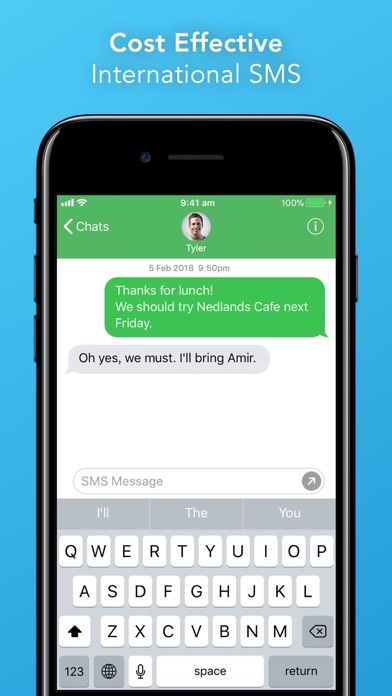 Try World Message now and message family, friends and colleagues for free with our App-to-App Messaging feature. 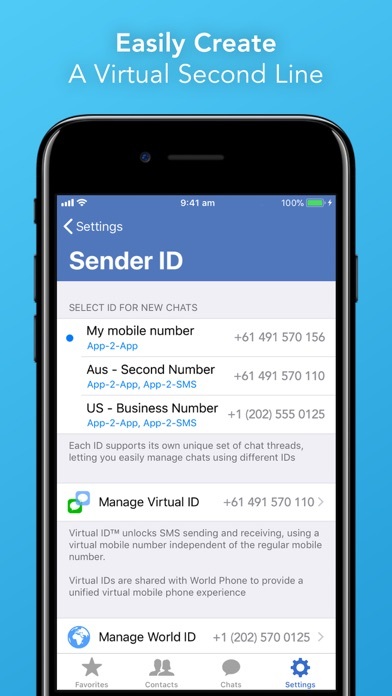 INTERNATIONAL SMS AND IM World Message brings International SMS and Instant Messaging together in an easy and familiar format, giving you simple, low-cost text messaging to anyone around the world. Be Local™ Effortlessly rent a new local or international number in World Phone with Virtual and World IDs. It's a second phone in your phone! Use these numbers for business, travel or family in foreign countries. Available in 19 countries. FREE APP-TO-APP MESSAGES Enjoy free calls to any World Message user, no matter where they are in the world! 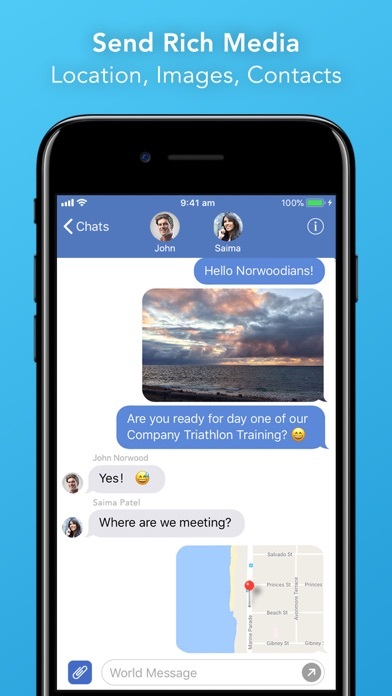 GROUP CHATS Send SMS or INSTANT Messages to multiple contacts at once or create a group chat where everyone can take part. LOW-COST GLOBAL SMS Enjoy competitive rates per SMS to any international destination. DYNAMIC FAVORITES Quickly access your most frequent and important message threads instantly from the Favorites menu. EASY CONTACTS Don’t wrestle with separate contact lists. World Message seamlessly integrates with your phone’s existing contact list. // FOR BUSINESS USE YOUR BUSINESS NUMBER(S) Send and receive SMS from a company-provisioned phone number through our Enterprise platform, Corona® Cloud. ARCHIVED COMMUNICATION When used in corporate deployments, all inbound and outbound messages can be archived for regulatory compliant archiving. It’s FCA, FINRA, HIPAA, and LSB compatible. SECURITY All messages are encrypted to ensure your information is secure. CONVENIENT AND COST-EFFECTIVE Leveraging the Corona® network seamlessly transfers your current high-cost mobile services and phone numbers to a low-cost Internet-based solution. Enable your Telco strategy without end-user resistance. -- Note 1. World Message does not manage your existing SMS messages. To include SMS, you can rent a number in over a dozen countries worldwide. 2. Messages sent between World Message users are not charged. 3. SMS messages sent from the App will be charged using World Credit purchased in-app. 4. To rent a number and send SMS messages, you must have a positive World Credit balance in your App. 5. World Credit and rented numbers can be shared between World Phone® and World Message.